Public Health England, who advised us on our book What are germs? have recommended the following links with top tips for keeping your children safe from infection. 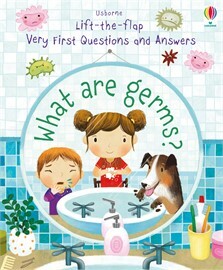 Watch Chaam, a Public Health England consultant, share the Usborne Lift-the-flap book What are germs? with two children, Ellie and Asoka. Washing your hands properly should take only 20 seconds - about as long as it takes to sing Happy Birthday twice! Have fun practising it with your kids and maybe you can come up with your own song. Watch a video clip on keeping your hands clean. Parents - take a pledge to help cut the unnecessary use of antibiotics, a campaign supported by Public Health England. This is a brilliant informative fun book to teach your little ones more about medicines, illnesses and germs. There was lots of facts about different types of germs and bugs and where they come from and how you get rid of them which is very useful to learn and teach my nearly 5 year old. The illustrations are warm and appealing, and the text uses a question and answer format with lift-the-flaps to get kids interested. [...] And with STEM subjects being all the rage right now, you are giving your budding doctor or researcher a little head start.